So it’s been just over 6 months since I first started rocking the MacBook Air and I think it’s about time to give a long-term update. Unfortunately, the news isn’t all that good. First, I’ve gotta say that obviously the Air’s design is top notch. Apple’s done an incredible job of designing a striking, stylish, compact computing machine. It’s ergonomic, it’s easy on the shoulder when in my messenger bag, and it’s beyond portable. 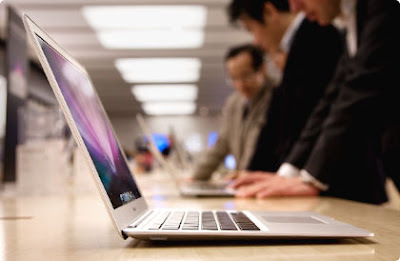 The MacBook Air is the easily the leader in the ultra-compact category. However, there are really two areas that I’m not so stoked on. The first is the straight-up hardware and performance. Unfortunately, I’ve already had to replace the Airport Card, antenna, and even the hard drive! Luckily the machine’s under an AppleCare plan and the doods at MacDocs had the foresight to do a quick Time Machine backup once the hard drive kicked back some unrecoverable errors. Now I can understand a faulty piece of hardware, but I have to say, I’ve never had to restart, force quit, or watch the spinning-beach-ball-of-death more than with this machine. And this occurs frequently, even during basic browser surfing, or blogging. Yeah, it kinda gets old. The other major struggle I’ve found is that this machine is from the future. Now it’s true that we’ve officially entered the future since we’ve now elected an African-American President, but the MacBook is apparently from an even more distant future. In the MacBook’s future, the internet is screaming fast, media can be compressed to miniscule sizes, and discs of any kind are non-existent. Though I look forward to this future, the fact of the matter is that it just isn’t here quite yet. I’ve found myself continually flustered by my inability to rip a disc in a hassle-free manner. It’s currently very difficult to manage and transfer media files wirelessly. And unfortunately, most of the infrastructure outside of my office and home just isn’t Air-friendly and find myself defaulting to my iPhone more often than not. The best part about the MacBook Air, is that it conjures up some serious wow-factor with clients, which is sweet. But more importantly, the Air is apparently the precursor to the new MacBooks. Prior to the Air, I at one point rocked the 12-inch PowerBook G4, and loved it. So if you’ve seen Jony Ive’s new 13-inch MacBook, I’m sure you can guess what my next computer will be! "In the MacBook’s future, the internet is screaming fast, media can be compressed to miniscule sizes, and discs of any kind are non-existent." Fantastic. And I totally agree that the new MacBook is in my future; my current model is coming up on 3-years.